Using glue or double-sided tape, begin assembly of the Hatbox Ghost by securing all tabs to their corresponding pieces in alphabetical order, starting with the A tabs on the head. Assemble the body, starting with the D tabs at the bottom. When the body is complete, attach the Hatbox Ghost's head. Assemble the legs, starting with the H tabs at the heel of each foot. Close the legs with the L tabs, and use the remaining tabs to secure the legs to the body. Fold each arm in half and secure so the design is two-sided. Butterfly the tabs outward and use them to attach the arms to the Hatbox Ghost's body. 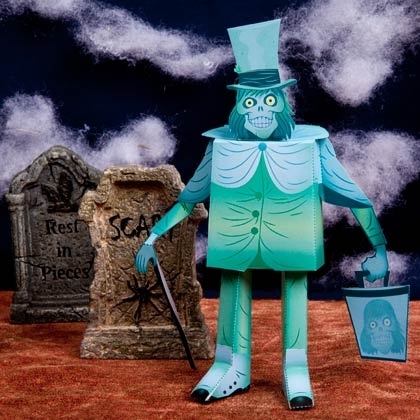 Fold the cane in half and secure so the design is two-sided, then attach the cane to the Hatbox Ghost's right hand.